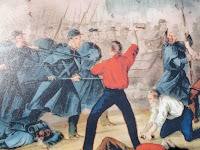 The First to Fall in Defense of the Union? One of the exhilarating--and sometimes frustrating--aspects of history is that there are times when there are no definitive answers, only opinions, theories, interpretations, and reasoned debates. In that respect, it can be very similar to being a sports fan. Quick, who's the greatest athlete of all-time? Who invented baseball? Good luck coming to a consensus. Well, with the 150th anniversary of the Civil War upon us, the question has been raised: Who was the first casualty of the Civil War? Who was the first to shed his blood for his country? The answer can be subject to interpretation. 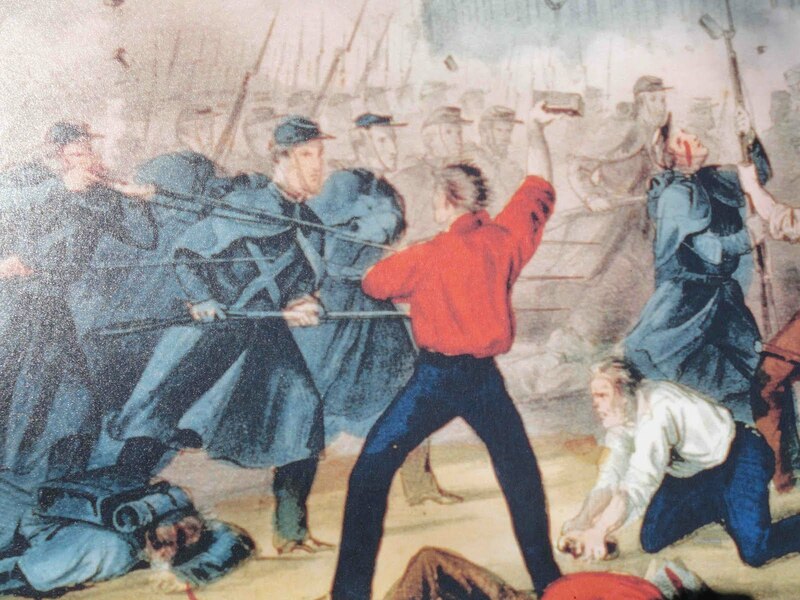 No soldiers were killed during the actual bombardment of Fort Sumter, but Private Daniel Hough, an Irish immigrant, was ironically felled during the formal surrender ceremony as a cannon misfired in the middle of a 100-gun salute as the United States flag was lowered. Some consider Daniel Hough the first casualty, albeit not at the hands of an enemy combatant. A week after the guns blazed in Charleston Harbor, the Sixth Massachusetts Regiment was marching through the streets of Baltimore when they were attacked by a secessionist mob on April 19, 1861 (the 86th anniversary of the opening shots of the Revolution at Lexington and Concord), in what is commonly known as the Pratt Street Riot. 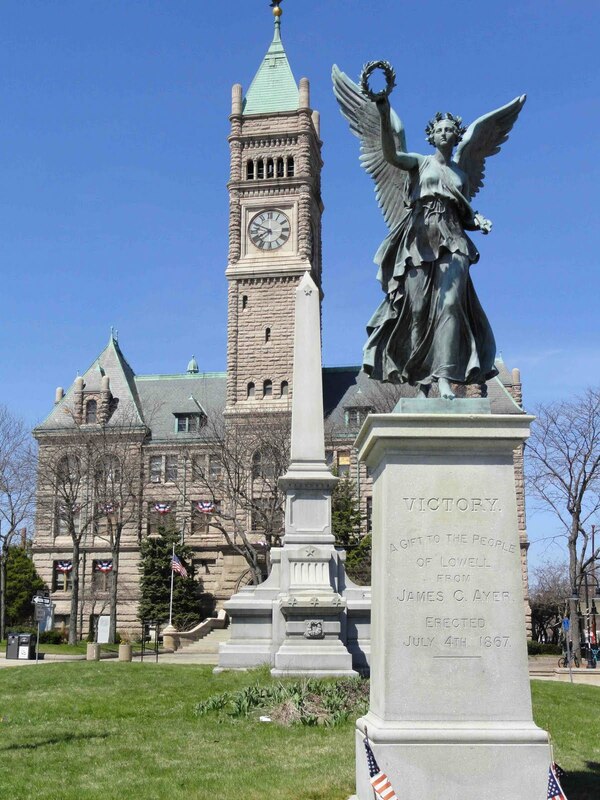 This weekend, Baltimore will be holding a commemoration of the event. Along with approximately a dozen civilians, four soldiers were among the dead. While not killed on the battlefield, some historians consider these the opening casualties of the war. The dead soldiers were all from my neck of the woods in the Merrimack Valley of Massachusetts, and here they rest today. 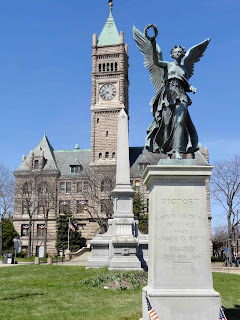 For years, I drove by an obelisk in front of Lowell City Hall and never gave it a thought, situated as it is in the middle of a large intersection, seemingly a giant traffic island. Now I'm embarrassed at my oversight. 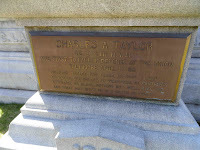 The obelisk marks the graves of three of the victims of the Pratt Street Riot: Luther Ladd, Addison Whitney, and Charles Taylor. When the obelisk was dedicated in 1865, Ladd and Whitney were interred there, so their names are inscribed on the base of the obelisk, which is often referred to as the "Ladd and Whitney Monument." 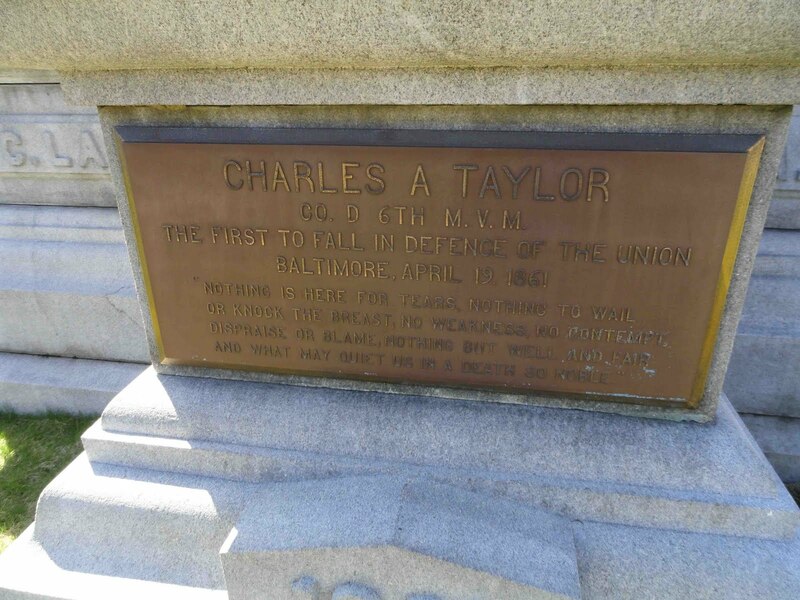 Taylor was originally buried in Baltimore, but I've read some accounts that he was subsequently interred at the site in the early 1900s. There is a plaque in his honor, which calls him "The First to Fall in Defence of the Union." Fact? I don't think we'll ever know definitively. As I said, the monument and gravesite are a bit lost in the hustle and bustle of today's car traffic. Check out this antique stereograph view of the monument. It was fenced off and surrounded by cannons, which gave it some context. The New York Public Library's digital collection has other terrific stereographs of commemorations at the obelisk, which to me seem drenched in the Victorian maudlin of the time. A massive arch in one of the stereographs says, "We strew with flowers the graves of our honored dead." Boy do they. Today, there is interpretive signage about the Baltimore riots, but it is caddy corner across Dutton and Merrimack Streets at Lowell National Historical Park, a little out of the way. The fourth soldier to die was Sumner Needham. He passed away more than a week later from his wounds, so we can definitively say he was not the first to die for the Union. His body rests in Bellevue Cemetery in Lawrence. I tried unsuccessfully to find his grave marker, so I'll have to make another go of it. This weekend in Massachusetts we will be commemorating Patriots Day and the start of the American Revolution with various ceremonies and re-enactments. Unfortunately, I haven't come across any commemorations in honor of this other band of American patriots who sacrificed their lives on an April 19. If anyone know of any that are planned, please pass along the information. More photos of the Ladd and Whitney Monument here. What's New at Fenway Park in 2011? Good news: You can now get a good stiff drink at Fenway Park. Bad news: The way the season has been going, you’re going to need it. On Friday afternoon, the Red Sox blissfully return to Fenway Park and hopefully benefit from some home cooking after a horrendous road trip to kick off the 2011 season. Friday’s home opener will mark the start of Fenway Park’s 100th season, and just as they did for their first-ever game in the ballpark, the Sox will take on the Yankees. Hopefully history can repeat itself as Boston beat New York in Fenway’s inaugural game. So what’s new at Fenway Park in 2011? Well, the biggest changes were supposed to be on the field with the additions of Adrian Gonzalez and Carl Crawford and an overhauled bullpen. So far, the biggest change has indeed been on the field: losing. I’m confident (well, hopeful? ), though, that they are simply getting the losing out of their system really early in the season. New scoreboards. Perhaps the most notable will be three new high def, LED scoreboards. The biggest one will be directly above the bleachers in center field. It is 38 feet high and 100 feet wide. By comparison, the old scoreboard was 23 feet high and 30 feet wide. So it’s going to be a really noticeable difference. In fact, the huge screen makes it looks like our computer overlords have come into Fenway to keep an eye on things. The previously existing hitters and pitchers board in left center field, which recorded pitch counts and speed, has been transformed into a 17 feet high by 100 feet wide video display. A third video screen, 16 feet high by 30 feet wide, will be above the bleachers in right field. These video systems will prominently feature real-time information such as batter and pitcher stats, pitch speed and type, box scores, and other messaging. Another element added beyond the right field bleachers is a large analog clock sponsored by security company ADT. New right field seats. This off-season marked the completion of the repair and waterproofing of the concrete lower seating bowl, a project that started in 2007, with work done in right field. What fans will notice most from the project are new seats in the dugout, field box, loge box, and right field box sections. The new seats sport cup holders, and padding was added to field box seats. Grandstand seats in right field were refurbished and now have self-rising mechanism that allow seats to retract automatically when they are empty. Your knee caps will particularly appreciate that change. Gate D improvements. The Sox made improvements to Fenway around Gate D, which is located near the corner of Yawkey Way and Van Ness Street. There are new and expanded concession and merchandise stands. And a walk-in team store! Can’t imagine where they came up with the space to get that done since the area around Gate D can oftentimes resemble a cattle call. There’s now a ticket booth at Gate D where will-call tickets for any gate will be available for pick-up. There are also new, big televisions in what is now dubbed the “Home Plate Concourse.” The concourse has also been freshly paved, so say goodbye to those discarded pieces of gum that have been stuck to the ground there since Ted Williams roamed left field. New concessions. Now about the new lineup additions that most fans care about: the food. Among the new concession items for 2011 are sushi from BASHO Japanese Brasserie and a Jamba Juice stand in the Big Concourse behind right field. In the new Home Plate Concourse concession stands there are brick oven pizza and a fishmongers dream: lobster rolls, fried clam rolls, Cajun shrimp rolls, fish sandwiches, and fish and chips. There will be season fresh fruit (didn’t see that one coming) along with saltwater taffy and assorted nuts (not of the Bill Lee variety). Out on Yawkey Way, a new “Wally’s Favorites” stand will sell fried dough, funnel cake, kettle corn, and cotton candy. The “Taste of Fenway” stand will have a menu comprised of different seasonal selection and offerings from Fenway’s restaurants such as the Absolut Clubhouse Burger. The popular Fenway Smokehouse will now have a picnic area by the NESN pre-game stage near Gate D.
Fans can get in on the action to finalize the menu by choosing one of two signature sandwiches: the Monster Roast Beef Sandwich (with sautéed onion and barbecue sausce) and the Turkey Gobble Sandwich (with cranberry sauce, hot stuffing and gravy). Both will be sold throughout the first half of 2011, and you can vote at www.redsox.com/sandwich. The winner at the All-Star Break will be called up to the big show for the rest of the season. The other, presumably, will be sent down to Pawtucket. If I were the Turkey Gobbler, I’d get ready for the chopping block. Those looking for “lighter fare” will find vegetarian pizza, veggie dogs, and veggie burgers, and chef and garden salads among the new menu items. Wally’s World. The family-friendly play area launched last July, and it will be back this year for Friday, Saturday, and Sunday home games from the 2nd inning through the 7th inning (weather permitting). Located on Yawkey Way, it includes games, activities and concession items targeted towards children, and an opportunity for kids to see Wally the Green Monster during the 3rd and 4th inning. Mixed drinks. Finally, now it’s not just the hoi polloi who get to souse themselves on mixed drinks at Fenway. There’s a tentative agreement that could allow the Red Sox to sell mixed drinks at multiple locations throughout the ballpark starting next month. Sales would stop two hours after the game starts (beer sales currently shut down two-and-a-half hours after first pitch). The team said that the alcohol content of the mixed drinks would be no greater than the alcohol content of a beer, so don’t get too excited. While those in premium seats can get straight alcohol, either on the rocks or in shots. The rest of the park will still miss out. And mixed drink concessions will not be located in the bleachers. For some reason I guess they think bleacher creatures have a problem holding their alcohol. Hmm…wonder why. For more on the changes at Fenway Park, visit the Red Sox web site. Plus, check out The Die-Hard Sports Fan’s Guide to Boston for more on Red Sox history and all you need to know to have a great day at Fenway, from where to eat and drink before and after the game to where to get tickets and autographs, and even how to snag a foul ball and get on TV.